Here you can see how we are arranged up top. The spare wheel on the bonnet goes with the spare on the back door. The two water and two fuel jerry cans are mostly empty unless we go somewhere remote. The water is a backup in case we spring a leak in the main water tank. The blue boxes hold dive kit, food stashes and camping gear. 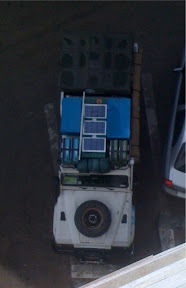 The middle box has been rigged with three small solar panels that can be connected to the spare battery to top it up. The lid comes off so we can prop it up at an angle to catch optimum sunlight. The box is filled with spare tent covers. Between the jerry cans at the front is the Hilton, our guest tent of choice, and the green square at the back is our own roof tent, home for the last six months. On the right the rolled up awning is just visible.